Roosevelt was saying, in essence, that the only thing we need to be afraid of is being held back by our own fears. If we can just escape the paralyzing grip of those fears, we will begin to “convert retreat into advance” and overcome any obstacle before us. Fear, and fear alone, separates us from our goals. 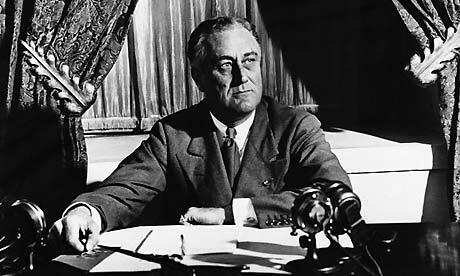 In his first of many famous radio-hosted “fireside chats,” Roosevelt promised the American public that “Confidence and courage are the essentials of success in carrying out our plan,” and invited the nation to “unite in banishing fear.” Fear was the enemy restraining the country, and Roosevelt was determined to root it out. Fear can certainly be a paralyzing force. No human being has made it through this life without experiencing its icy clutches. We can fear people; we can fear the future; we can fear failure—if it’s out there, it can be feared. But…is fear really the enemy? Is “fear itself” really what we need to be afraid of? “Fear God.” What does that mean? Is that the “nameless, unreasoning, unjustified terror” Roosevelt warned against? Not quite. The Hebrew word translated here as “fear” is yare’ (H3372), and it refers to a fear brought about through awe and astonishment. To fear God is to stand in awe of who He is, to have a healthy sense of respect and honor for His position as Creator and Sustainer of the universe. Coupled right beside this admonition is another to “keep His commandments.” If we truly fear God, if we truly respect and honor who He is, then we will be doing the things He tells us to do! There is so much we can be afraid of in this world. In our personal lives and on a global scale, it can often feel as though we are perpetually one false step away from a self-destructive meltdown. From the threat of unpaid bills to the threat of a reckless nation triggering World War III, it’s increasingly difficult to place any sort of confidence in the stuff of day to day life. But we don’t have to. In fact, we shouldn’t. Our trust—and our fear—belongs in one place, and one place only: in the Lord our God. Then “we may boldly say: ‘The Lord is my helper; I will not fear. What can man do to me? '” (Hebrews 13:6). 2 Responses to "The Only Thing We Have to Fear"
Thank you! Very helpful to keep my mind on track!